Once again, we're expanding our drop in style kits for SB Ford. Here is another version of our Max Output II Beehive Springs for GT40 heads. This version offers 150 Lbs seat pressure which is intended for aggressive hyd roller cams, turbo or supercharged engines in need of higher seat and open pressures. These beehives fit right onto the stepped spring base of GT40 heads without the need for machine work. The springs are made using premium grade multi arc "ovate" wire and manufactured here in the USA. Proud to say, these are an Alex's Parts exclusive- custom made to our specifications by PAC racing springs. Another welcomed additional to our "Max Output II" spring family! Manufactured from Multi Arc Ovate Wire. Parts included: Chrome Moly Beehive Retainers, Custom Beehive Springs and Hardened 7 degree valve locks. Spring seat machining is not necessary, the spring fits right onto a OE SB Ford stepped spring base. If needed, order the kit to work with .393"/.393" tip length valves. Use this option for Ford racing valves w/ .383"/.383" tip length valves. We're currently offering these at a discounted price. Pick up a custom built beehive spring kit for around the same price the other guys charge for their beehive springs alone. Our customers know we're very serious about our spring kits. Our quality can be compared to parts selling for well over twice the price and we continue to step up our game with improvements in material and design. When you order from us, you're getting the best possible value available anywhere. Average shipment date is around 7 days after order date. If you need it quicker, be sure to order early or contact us about rush order costs/options. Q- How important is it to measure valve spring installed heights? Measuring installed heights will assure the intended seat and open loads are achieved. If the installed heights are not measured, how can the builder be sure they are correct? On a staggered tip length application (like SBF Gt40/P), what if the builder mixes up the retainers and locks and installs them in a reverse orientation? If any of the parts are mixed up, it could create serious problems. If installed height measurements are taken, the builder would easily find these mistakes and correct them before final assembly. Builders who want maximum performance will always measure their installed heights and add shims as needed to get the installed heights as close as possible to the target spec card included. Q- How close do I need to get the installed heights to the target height spec? A- As close as you can with a tolerance of minus .015" to target height. In order to improve installed height accuracy and if it's possible, it's wise to set it up between .005"-.008" on the low side of the target height. Once the engine is run, the locks will seat further into the retainer. This is a natural process, 7 degree hardware will wedge tight together and as this happens, the installed height will increase a very small amount so it's better to lean on the lower side of target height. Q- Will I need an installed height micrometer to set up the installed heights? A- Yes, in order to set up installed heights, an installed height micrometer intended for beehive springs and one which is compatible with OE type SB Ford heads is required. Q- We have a beehive installed height mic which we used on another application- will it work on my SB Ford heads? A- That depends on the brand and model of the mic. 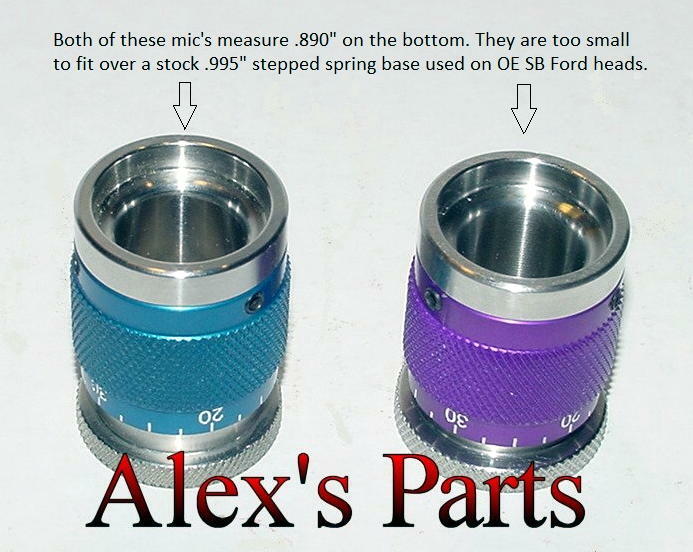 Many height mics designed for beehive springs are made for LS Chevy or aftermarket heads which won't fit a stepped SB Ford spring base. 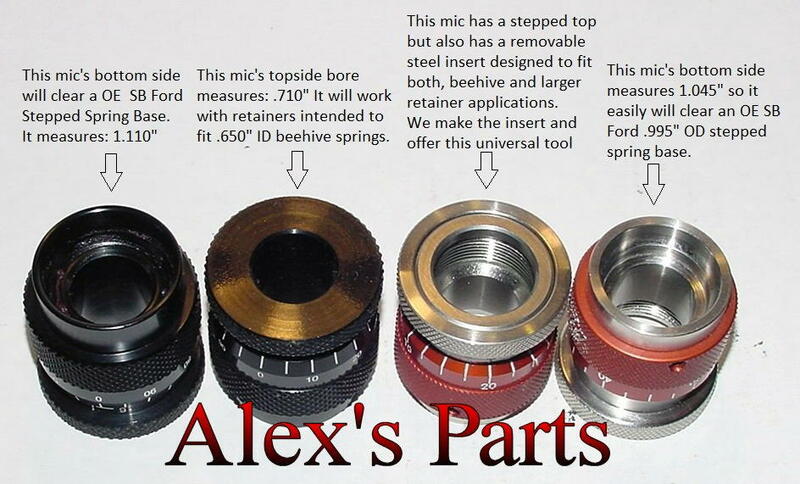 Q- How can I determine if the beehive mic we already have will work on a SB Ford? Q- Can I measure the installed heights with a machinist scale, snap gauges or calipers? A- Negative, this is not a viable option when using beehive retainers for the following reasons. Using calipers, snap gauges or a machinist scale only work when the measurement is taken parallel to the valve stem, not at an angle. Since a SB Ford's stepped spring base is bigger than the retainer, it cannot be easily measured straight up and down. Q- My existing installed height Micrometer has a stepped top surface which the beehive retainer enters into and contacts the bottom of the step below. The readings I'm getting are .150"+ more than my target installed height. Whats going on and how do I deal with this? A- This condition happens when an installed height mic designed for larger OD retainers is used with a beehive set up. On common "cylindrical spring" installed height mic's, the shape of the top of the mic is intended to clear the first step used on bigger retainers. Most beehive retainers are too small for Std installed height mic's and will fall into the counter bore which produces an inaccurate measurement. Q- How do I determine if the top side of my mic will work with a typical beehive retainer? A- Just measure the inside diameter of the topside of the mic and compare it to the OD of the retainer. The retainer must sit on the top surface of the mic and not inside its counterbore. Q- Do I need hardened shims? A- Yes. Std shims are too soft and will break down during use. Std shims should not be used because as they wear down, fine metal particulate will contaminate the oil. Click the button below to add the *NEW* Max Output II Drop in style Beehive Valve Spring Kit, SBF GT40, 150 Lb Seat to your wish list.